I need to have my journal article, dissertation, or term paper edited and proofread, or I need help with things like admissions essays and proposals. It's a publish-or-perish world that you live in. Between teaching responsibilities, administrative duties, and pursuing funding opportunities, it's hard to get in any solid research time. Let Scribendi ease your burden—we can act as your virtual assistant, editing your papers to make them stronger, clearer, and more concise. We can proofread your final drafts, too, making sure your paper is judged on merit and not rejected because of spelling and grammar mistakes. We can also deal with those tedious author submission requirements, making sure your document complies with your target journal's style. If you have any questions about our academic services, please feel free to check out our Academic FAQs. We're guessing that you could use some help expressing your ideas, improving your writing, and taking care of those fiddly details, like style and citation format. You're pressed for time, but so are your fellow classmates or colleagues, so they can't provide that all-important objective review of your work. This is where we come in. 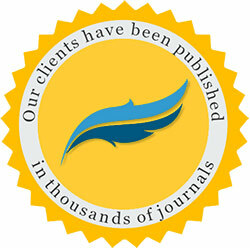 Over the past 20 years, Scribendi has helped academics get published in thousands of top journals. See which journals. A proofreading service for final drafts of journal articles, reports, letters, posters, conferences, papers, research, and more. We will review your work for spelling, grammar, or typographical errors and check your references and citations against a style guide. We'll help with your work in progress, checking for clarity, organization, tone, and other content issues, as well as providing a first pass on spelling, grammar, and typographical errors.